Rocky's championship picture at Yorkton with owner / handler Bonnie Geall. 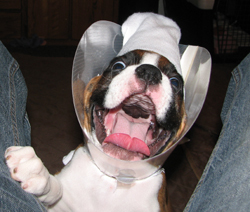 Rocky simply loves life. 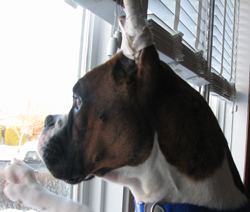 We sometimes joke that he could be the Wal Mart greeter greeting people (& dogs) with not only a smile but that oh-so-cute happy boxer body wiggle! From outdoor walks to adventures in agility and conformation training, he has demonstrated that he is a good little worker, especially when it is fun and involves that tasty liver bait or sausage! He has a stubborn streak and has proven that he is very head strong. But on the flip, he becomes very soft and sensitive when he senses someone needs him for comfort or if he is scolded for eating one of Mom's plants! He is happiest when he is the centre of attention, especially if that means cuddle time! Rocky is truly a joy in our lives and has made our hearts and home complete. We are very happy and lucky to have him. Rocky is a litter mate to Declan, Rooney, Lennon, and Abby who have all been showing in Canada. Rocky’s show career . 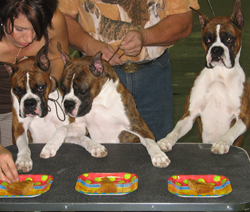 . .
Rocky and Bonnie have been going to handling classes; they have fun and have been learning lots -- and that's evident from the first time they entered an actual dog show. They look like they've been doing this for more than just a few months! 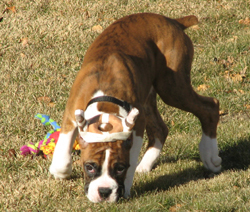 Rocky is a boisterous puppy outside the ring but knows what his job is once he's inside the ring. Rocky is the 6th champion for his dam. 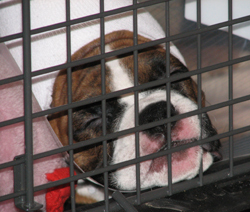 On 19 - 21 May 2007, Rocky went reserve male three days in a row at the Band City Kennel and Obedience Club dog show at Moose Jaw, Saskatchewan under judges Don Emslie, Phyllis Wolfish, and Lynn Storeshaw. He was shown each day by Bonnie. 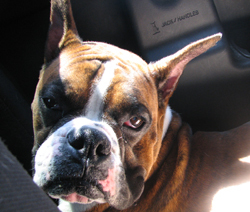 On 08 - 10 June 2007, Rocky went reserve male three days in a row at the Regina Kennel and Obedience Club dog show at Emerald Park, Saskatchewan under judges Skip Stanbridge, Richard Lake, and Rick Fehler. He was shown each day by Dave Gilmour. 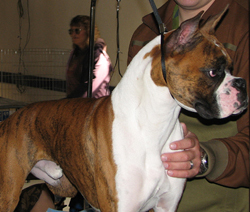 On 27 - 29 July 2007, Rocky went reserve male six times at each of the six shows judged by Archie Warnock, Fred Dewsbury, Doug Gaudin, Avery Gaudin, Barbara Watt, and Terry Carter at the Southwest Saskatchewan Kennel and Obedience Club dog show at Swift Current, Saskatchewan. He was shown by Bonnie. 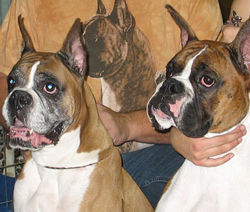 On 24 August 2007, Rocky gets winners male and best of winners for 2 points under judge Judith Hunt at the Shamrock Kennel and Obedience Club dog show at Yorkton, Saskatchewan. Later that day, Rocky gets winners male, best of winners, best of breed, best puppy in breed and best puppy in group for 3 points under judge Susan Badick. Rocky was shown by Bonnie. 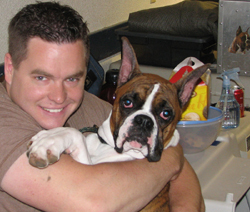 On 25 August 2007, Rocky gets winners male and best of winners for 2 points under judge Chris Neilson at the Shamrock Kennel and Obedience Club dog show at Yorkton, Saskatchewan. Later that day, Rocky gets winners male for 1 point under judge Janet Buchanan. Rocky was shown by Bonnie. 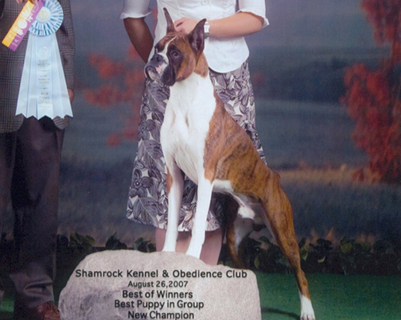 On 26 August 2007, Rocky gets winners male, best of winners, best of breed, best puppy in breed and best puppy in group for 3 points under judge Charles Hunt at the Shamrock Kennel and Obedience Club dog show at Yorkton, Saskatchewan. This win makes him a new champion! Later that day, Rocky gets winners male and best of winners for 2 points under judge Denise Cornellson. Rocky was shown by Bonnie. Rocky showing off his very long tongue. 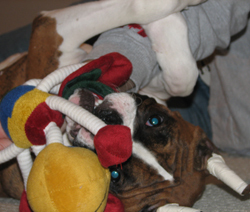 Rocky really, really likes his toys. 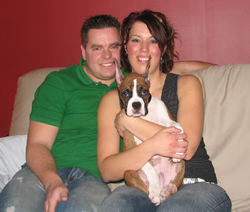 Rocky with Richard and Bonnie in a family portrait. 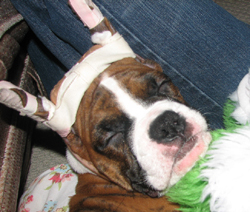 Rocky taking a snooze with one of his toys. 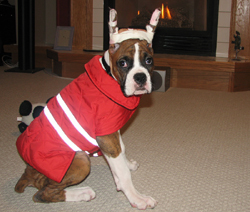 Rocky sporting a snazzy new red coat. Rocky wants to be tracker when he grows up. Rocky checking out the front room window. Rocky and Richard enjoying their first dog show. 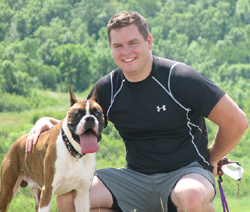 Rocky and Richard exploring the Wascana Hills. Rocky and Bonnie taking a break while out walking. Rocky and Richard resting at the top of a long path. Rocky on a grooming table at his very first show. BOW, BOB, BPIG at Yorkton with Bonnie handling. Rocky's sleepy face at the end of a long fun day. 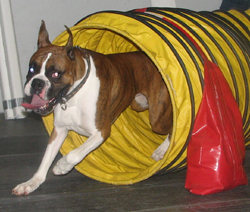 Rocky ripping through an agility tunnel. Rocky posing with his mother, Sawyer. Rocky, Declan and Lennon eating birthday cake. 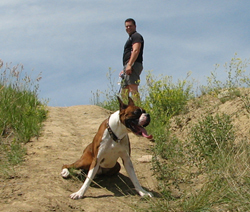 Rocky with Richard and Rhodesian Ridgeback, Gunnar. Just look at the length of that tongue! 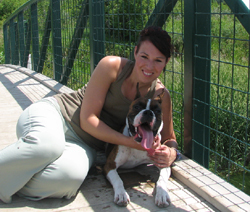 Rocky with Bonnie at the 2007 Yorkton dog show.